I’m a firm believer that all dogs are good, but I also recognize that different breeds are good in different ways. For example, Labradors are known for their intelligence and good temperament, German Shepherds are known for being extremely protective of their owners, and Bulldogs are known for… well, not much, apart from drooling, chilling on the couch, and generally being lazy. As cute as they are, they’re not exactly renowned for their athleticism! However, rules are made to be broken, and one particular bulldog has exceeded all expectations at the Westminster Dog Show, which is currently taking place in New York. A little guy called Rudy defied his breed’s characteristics when he turned in an amazing performance on the show’s difficult agility course. 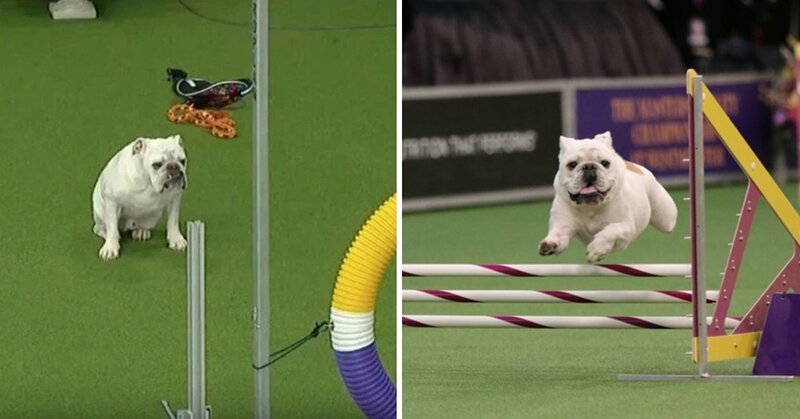 There were plenty of eyebrows raised when a bulldog stepped up to take part, but Rudy totally nailed it on Sunday when he sped through the course – stunning both the audience and the Internet into realizing that sometimes bulldogs aren’t so lazy, after all. I mean, just look at him go! Sadly, the speedy little guy didn’t actually win the race – eventually coming second to a border collie – but it was Rudy who took the headlines and won the hearts of the public. People on social media were left both surprised and impressed by Rudy’s run, with many saying they never knew bulldogs could run at all, let alone that fast, and with that much agility. While another said they’d ‘never seen one get off the couch’. Some people joked that Rudy had ruined things for other bulldogs, who’d managed to trick humans into thinking they couldn’t run, and were destined for a life of lazing around. Clearly, the others need to step their game up! “Rudy done messed it up for every lazy bulldog out there,” one person quipped. Rudy did an amazing job, and proved to everyone that you should never judge a book by its cover.